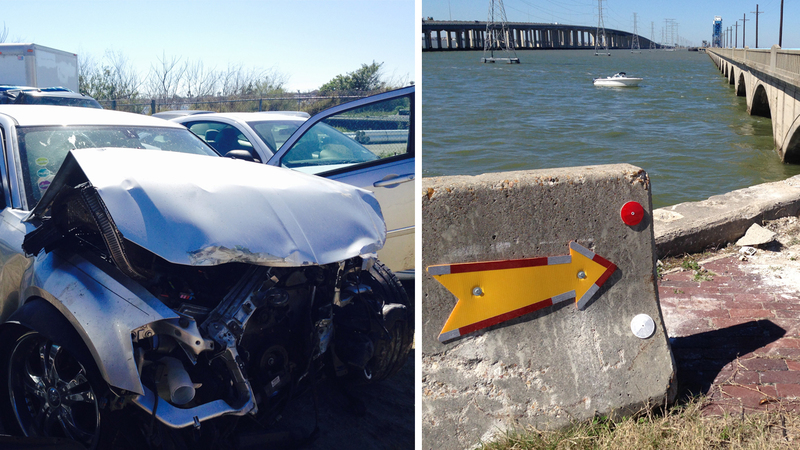 GALVESTON, TX (KTRK) -- A Galveston woman is in good condition at UTMB after driving off the old causeway and into the water. At both ends of the causeway and under it you can often find people fishing. Fisherman Joe Smith says, "This area is popular and over off 61st." But fishermen have trouble imagining what happened late Tuesday night just across the water. Smith adds, "People will fish over there but I've never heard of any accidents like that." Rescue crews were called to the area where the old causeway, now lined with bricks and weeds along the train tracks, ends right into the water. Tow truck driver James Duncan says, "The car was on its side in the water." Police say 36-year-old Andrea Gonzales drove off the end, beyond the barricades, and plunged into the water. Duncan says, "Probably 25 feet or more, that's just to the bottom of the concrete then you still have however deep the water is." Her Dodge Magnum is now a crushed mess. The airbag deployed and a rosary is still hanging from the rear view mirror. Duncan says, "When you look at it, surprised they are even alive." The tow truck driver says it's not the first time he has pulled a car from the exact same location. Last summer, another car went right off the end too. Police are investigating what happened in Gonzales' case. "How they even climbed out of there is the bigger question," Duncan said. Smith wants to know too. Smith says, "We went over there plenty of times and we didn't drive off."